We were not really really "close" friends and you will understand why. He didn't care much for people in his face. I learned to like him though. 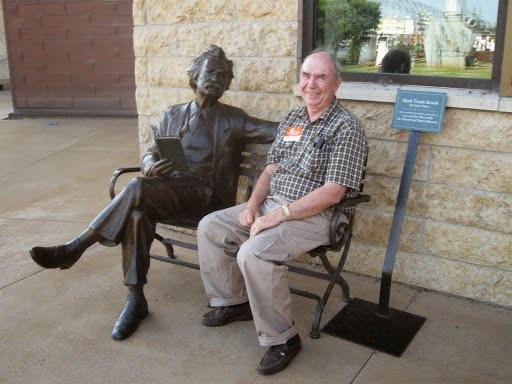 And I mostly respected his spirit. It was the spirit of the wilderness. The spirit of independence. The spirit of an age largely gone by. He lived life to the fullest. His name was # 6. Let me tell you how we met. I first saw him on a video from the National Park Service. 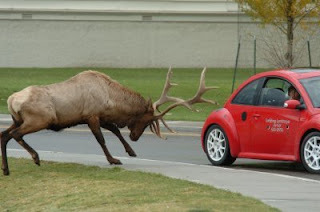 It was mostly showing why it's not a good idea to to get too close to the buffalo, bear and elk in Yellowstone Park. Springs. There is a restaurant there as part of the headquarters complex. In the video, a bunch of tourists are standing on the concrete steps leading to the entrance to the restaurant. 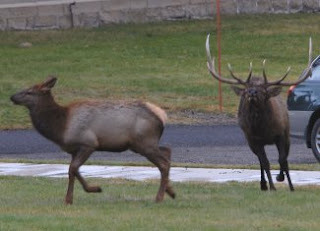 They are watching a massive elk, which is standing on the sidewalk, minding his own business. Then a tourist comes up the sidewalk, walks within a few feet of the elk and takes a flash picture right in his face. 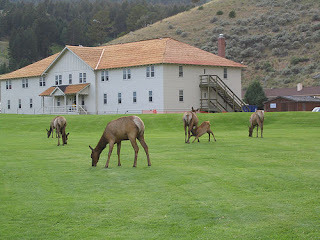 The tourists turns around and begins walking away, when the elk gives him a shot from behind. No fatality here but a nasty leg gash for the foolish tourist. lawn beside our little cabin. We had a talk and I gave him the "life goes on" pitch. I don't know if he bought it. Perhaps, he was already plotting his comeback for the next year. A bull elk well known to fall visitors to Mammoth Hot Springs has died as the result of a freak accident. The animal, known as "Number 6" due to his orange and black ear tag, was found dead Sunday night in Gardiner, Montana. Montana Fish, Wildlife, and Parks staff members believe the animal tripped while trying to cross a fence and somersaulted onto his back, where he was pinned between rocks with his antlers beneath him and suffocated. A necropsy indicated that bull was at least 15 years old and weighed 725 pounds. Elk have an average life span of 13 to 18 years, with bulls typically topping the scales at 700 pounds. His rack, although diminished in size from previous years, still gross scored an impressive 356-5/8 on the Boone and Crockett scale. 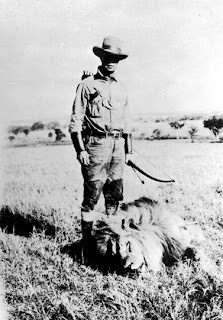 At his peak, the animal would certainly have been considered a "trophy" by elk hunters. Several large bulls with impressive antlers venture into Mammoth Hot Springs each fall to compete for the attention of cow elk during mating season. 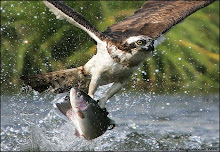 The aggressive behavior of these animals brings with it a threat to people and property. Number 6, and his regular sparring partner Number 10, were both ear tagged several years ago. Number 6 had his antlers removed in August 2004 and again in August 2005 in an effort to reduce the danger he posed to park visitors. 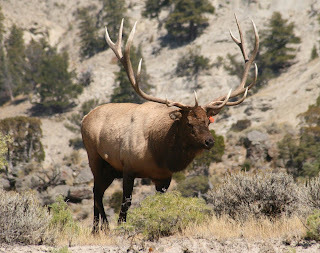 Number 10 was last seen in the Mammoth Hot Springs area shortly after the rut concluded. In the fall, a dedicated group of park staff and volunteers can be seen patrolling the Mammoth area, reminding visitors to stay at least 25 yards away from the animals. Those who fail to abide by this requirement not only put themselves in danger, they may also be subject to a citation and fine. Park regulations require people to stay at least 25 yards away from most animals and at least 100 yards away from bears and wolves at all times. Visitors desiring a closer look at animals should use binoculars, spotting scope, or the zoom lens on their still or video camera. "Ok," I replied not too thrilled. The breakfast was decent, the museum tour was terrific. club dedicated to conservation and record-keeping. Similar to the Boone and Crocket club for gunners. 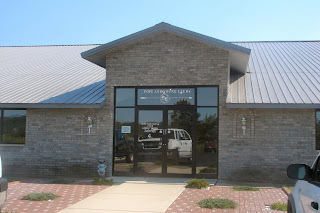 The museum had the history of bowhunting in dioramas and other exhibits. 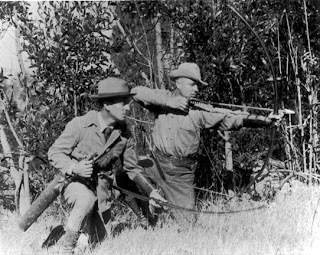 Saxton Pope and Art Young are the two gentlemen who are synonymous with the bowhunting revival that began near the start of the 20th century and continued through today. The images are taken from original lantern slides from the St. Charles Family Archery Collection. would be no "buck fever" for me because well... I was Mr. Cool. on a Saturday morning near Lanesboro. I had been placed at the head of a steep gully about fifteen yards above a small spring. 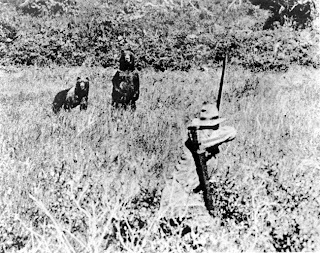 My hunting partners fanned out to either side after advising me that any deer would surely come up the ravine on their way to the spring. I was situated behind some bushes and directly in front of a large log. my right. The bushes concealed my vantage point. I never heard them approach me from the left. 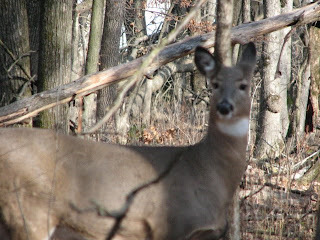 There were three deer which I saw out of the corner of my eye. feet in front of me on the other side of the bushes. Then she turned her head, lowered it slightly and stared right at me. laying across my lap) into a vertical position she twitched. slightly, draw the arrow, and shoot her straight thru the bushes. ran into a large obstacle.... my stomach. motion to stand up, the deer on the other side of the bush let out a loud "woof" and immediately all six deer scattered in six directions. I never got a shot off. I bowhunted a few more years after that but as my friends had moved on to other school districts, I found it was the cameraderie of the hunt that had been most appealing. Thus ended my deer hunting years although I continued with upland game and waterfowl but those are other stories.